HAMPTON, Va. (July 29, 2018) — Hampton University professors, along with elected officials, community members and the media, participated in a police active shooter simulation at the Sheraton Norfolk Waterside on Tuesday, July 10, 2018, getting a taste of what police officers experience every day. The Law Enforcement Legal Defense Fund is an organization located in Northern Virginia whose goal is to educate the public about police training through an educational police training simulator program where sessions are designed to inform participants on the law, training and practical considerations related to the use of police force. The training simulator features realistic scenarios where participants get to make decisions on what force might be necessary to resolve a situation, and then learn about different outcomes based on those decisions. Hampton University professors in the Department of Sociology & Criminal Justice are hoping to bring the simulation to campus to share with students, faculty, and staff. “What a great opportunity for our professors to gain knowledge about what police officers go through each day and to share that information with our students,” said Hampton University President Dr. William R. Harvey. "The Police are guardians of justice and provide safety for our communities." 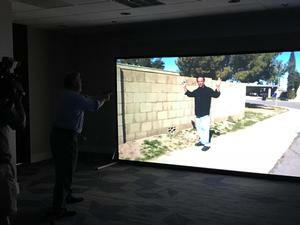 The training uses a screen and projector where various real-life situations play out and participants interact with the screen, while holding either a gun or Taser, and have to react and make the best decision possible to the situation that is playing out on the screen.